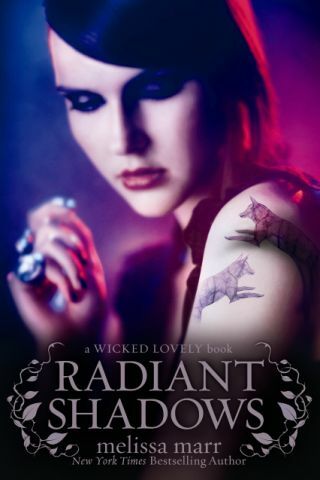 Radiant Shadows is book four in the Wicked Lovely series, the series I have to thank for bringing me into a full appreciation of the Young Adult books being published today. It's the story of Ani, a halfling, and Devlin, the High Queen's Bloody Hands. If you've been reading the series, and yes they should be read in order, you'll be familiar with these characters already, though not deeply. Ani is growing stronger and her hunger is growing with her. She's different, however, than other half mortals, she's stronger and she needs to feed in different ways. Devlin is fighting to keep his emotions at bay, he shouldn't have any, he's woven from the blood of both the High Queen, Sorcha, and War, Bananach. Things have changed in faerie, though, and Sorcha isn't herself and Devlin must do something to protect her...even if it means confronting the one secret he has kept from her, the fact that was he was meant to have killed Ani when she was a baby. Did I like Radiant Shadows? Yes, very much. I love slipping into this world Melissa Marr has created for all the reasons I mentioned in the first paragraph. I love the way she paints a scene, the way in which she allows us to experience her characters through their emotions and longing. I love this world so full of darkness and valiant struggle. I love Irial, who shows up in this one, I very much love Irial. Radiant Shadows moves the plot forward in a significant way, and I feel more fully fleshes out the world. I've read reviews where people don't like this book because it doesn't deal significantly with the main characters, similar to the sentiments expressed about Ink Exchange (possibly my favorite of the series). I disagree with this. What I love about these books is that the very crafting of the series speaks to it's themes of balance and perspective. Each book turns around inside the world and gives us a different angle. Each installment shows us how the events unfolding impact the fae involved. No one story is complete without the other. It's brilliant and beautiful. I think if you loved the first three, you'll love this one, too. I certainly did.